Last time we learned how the condenser within a power plant acts as a conservationist by transforming steam from the turbine exhaust back into water. This previously purified water, or condensate, contains valuable residual heat energy from its earlier journey through the power plant, making it perfect for reuse within the boiler, resulting in both water and fuel savings for the plant. 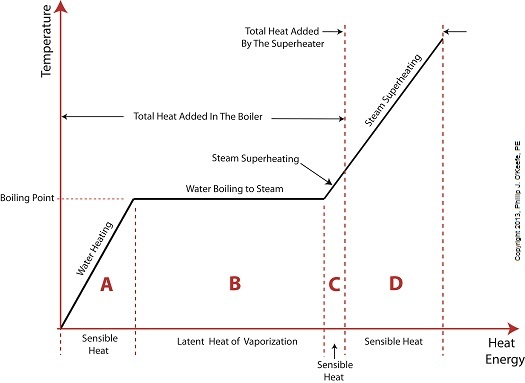 Today we’ll take a look at a highly pressurized form of condensate known as boiler feed water and how it helps the power plant save money by recycling residual heat energy in the steam and water cycle. Let’s begin by integrating the condenser into the big picture, the complete water-to-steam power plant cycle, to see how it fits in. 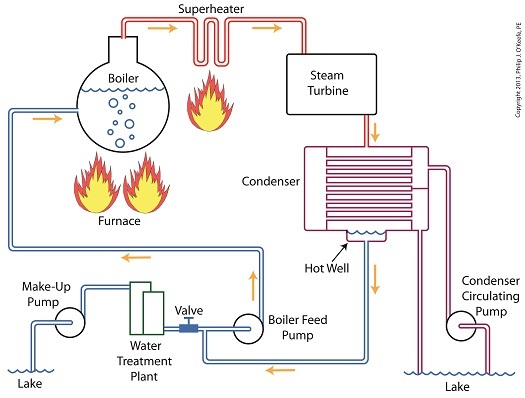 The illustration shows that both the make-up pump and the condenser circulating water pump draw water from the same supply source, in this case a lake. The circulating water pump continuously draws in water to keep the condenser tubes cool, while the make-up pump draws in water only when necessary, such as when initially filling the boiler or to make up for leaks during operation, leaks which typically occur due to worn operating parts. 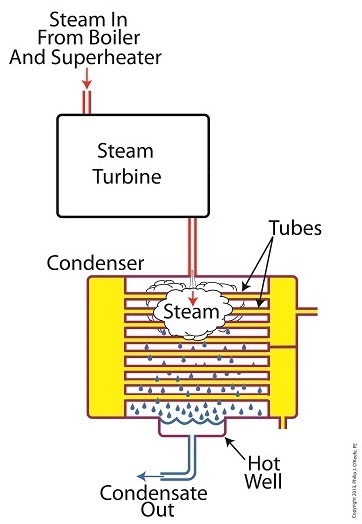 In a nutshell, the condenser recycles steam from the turbine exhaust for its reuse within the power plant. The journey begins when condensate drains from the hot well located at the bottom of the condenser, then gets siphoned into the boiler feed pump. If you recall from a previous article, the boiler feed pump is a powerful pump that delivers water to the boiler at high pressures, typically more than 1,500 pounds per square inch in modern power plants. After its pressure has been raised by the pump, the condensate is known as boiler feed water. The boiler feed water leaves the boiler feed pump and enters the boiler, where it will once again be transformed into steam, and the water-to-steam cycle starts all over again. That is, boiler feed water is turned to steam, it’s superheated to drive the turbine, then condenses back into condensate, and finally it’s returned to the boiler again by the boiler feed pump. Trace its journey along this closed loop by following the yellow arrows in the illustration. While you were following the arrows you may have noticed a new valve in the illustration. It’s on the pipe leading from the water treatment plant to the boiler feed pump. Next time we’ll see how this small but important item comes into play in the operation of our basic power plant steam and water cycle. 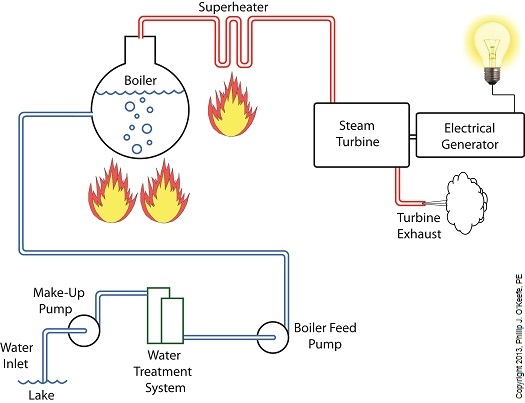 We’ve been discussing various aspects of a power plant’s water-to-steam cycle, from machinery specifics to identifying inefficiencies, and today we’ll do more of the same by introducing the condenser hot well and discussing its importance as a key contributor to the conservation of energy, specifically heat energy. Let’s start by returning our attention to the steam inside the condenser vessel. Last week we traced the path of the condenser’s tubes and learned that the cool water contained within them serve to regulate the steam’s temperature surrounding them so that temperatures don’t rise dangerously high. To fully understand the important result of this dynamic we have to revisit the concept of latent heat energy explored in a previous article. More specifically, how this energy factors into the transformation of water into steam and vice versa. Steam entering the condenser from the steam turbine contains latent heat energy that was added earlier in the water/steam cycle by the boiler. This steam enters the condenser just above the boiling point of water, and it will give up all of its latent heat energy due to its attraction to the cool water inside the condenser tubes. This initiates the process of condensation, and water droplets form on the exterior surfaces of the tubes. The water droplets fall like rain from the tube surfaces into the hot well situated at the bottom of the condenser. This hot well is essentially a large basin that serves as a collection point for the condensed water, otherwise known as condensate. It’s important to collect the condensate in the hot well and not just empty it back into the lake, because condensate is water that has already undergone the process of purification. It’s been made to pass through a water treatment plant prior to being put to use in the boiler, and that purified water took both time and energy to create. The purified condensate also contains a lot of sensible heat energy which was added by the boiler to raise the water temperature to boiling point, as we learned in another previous article. This heat energy was produced by the burning of expensive fuels, such as coal, oil, or natural gas. So it’s clear that the condensate collecting in the hot well has already had a lot of energy put into it, energy we don’t want to lose, and that’s why its an integral part of the water-to-steam setup. It acts as a reservoir, and the drain in its bottom allows the condensate to flow from the condenser, then follow a path to the boiler, where it will be recycled and put to renewed use within the power plant. Next week we’ll follow that path to see how the condensate’s residual heat energy is put to good use.